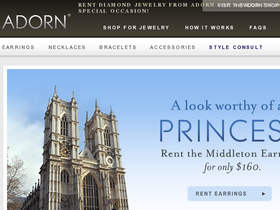 Visit Adorn, at Adorn.com to be a part of an exciting new concept of renting exquisite jewelry instead of purchasing. Adorn is proud to be the first to bring it to you. Adorn rents jewelry for your wedding to wear the finest elegant bridal jewelry on your special wedding day. You can relax, Adorn makes the process so easy and safe. In fact, renting jewelry from Adorn.com will be one of the least stressful parts of planning your wedding. Save on your rental from Adorn.com with Adorn discounts, Adorn coupons, Adorn promotions and Adorn savings found here on 58Coupons.com. Enjoy 20% off rented diamonds plus free shipping when you use this promo code at Adorn.com. Click link to save. Use this coupon code for a $50 discount on your $125 Adorn Brides rental. Click link to save today. Save 50% when you Rent Real Diamonds for Your Mom & Maids by renting two or more sets. Click link code for details. Rent Select Jewelry starting at only $75 from Adorn.com.